Retractable Banner Stands US now offers a new range of Pop Up Displays and Table Throws designed to maximize brand impact at trade shows, events and more. Brand identity is one of the most important strategic elements of a growing business, and the easiest way to increase the visibility of a brand is by catching the eye of those who pass by a business, no matter the location. Branded signage is one thing, but established businesses put their brand on everything from the pens to the table cloths, especially when trying to impress at trade shows and other events. Retractable Banner Stands US specializes in creating affordable branded stands, flags, pop up signs and more, and has just released a new range of affordable displays and table throws. 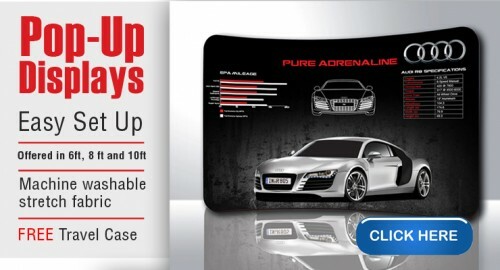 The pop up displays (http://www.retractablebannerstands.us/servlet/the-Pop-dsh-Up-Displays/Categories) are far from the average flat canvas, with curved and contoured displays that roll up into a tube to create a three dimensional textured surface that will stand out from the crowd. The table throws (http://www.retractablebannerstands.us/servlet/the-Trade-Show-Table-Throws/Categories) allow individuals to hide the base of their tables to use them for storage while at the same time providing a bold, big and front-facing logo that will immediately grab the attention of those in attendance. Both categories of products are affordable ways to present imagery and enhance brand identity in a way that cannot be achieved without them. About Retractable Banner Stands US: Retractable Banner Stands US is a leader in providing quality signage at affordable prices. Carrying everything from Advertising Flags, Banner Stands, Table Throws, Pop Up Displays, and much more. With no set up fees and no minimum orders, the company enables businesses of all scales to access top quality promotional materials.